You are advised to spend 45 minutes on this Section. The total number of marks for this section is 30. Answer both parts of this question using comedy programmes you have studied. 4. 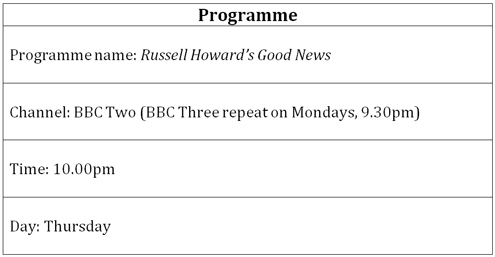 (a) Explain, in detail why one comedy programme was chosen by one channel and scheduled at one time on one day. Russell Howard’s Good News was scheduled by BBC Two in October 2014 as it had been previously been successfully shown on the BBC channel aimed at more of a youth demographic, BBC Three. On BBC Three it had achieved critical success (Russell Howard as a young writer and comedian appealed to this age group) but in scheduling the programme on BBC Three, it was hoped a broader, more stereotypically ‘high brow’ target audience of 30-55, B, C1 and C2 aspirers could be exploited. BBC Two has traditionally had an older, more educated target audience, scheduling a range of informative, educational and entertainment programmes whereas BBC Three has a primary focus to entertain their young audience - Russell Howard’s Good News is a comedy programme that uses the news as a vehicle for the comedy talent of the presenter, but in using up to date news items has an informative content to the programme. This was one of reasons why the BBC and production company Avalon rightly thought the programme would move from a niche to a wider, not necessarily mass audience on BBC Two.